A tiny, clear, cube-shaped gelatinous sea creature is armed with one of the deadliest venoms on our planet. Take it from one who knows too well the pain and paralysis of the Box Jellyfish. I have suffered their otherworldly stings three times now, in my attempts to swim from Cuba to Florida. Just as our Xtreme Dream Expedition Team has sought intelligent solutions in all areas of this perhaps impossible crossing -- from navigating the swirling and unpredictable eddies of the Gulf Stream... to providing some modicum of safety from the large predator sharks on pitch black nights... to exploring the outer limits of the human potential for endurance -- we have also reached out to the world's renowned expert on The Box Jelly. Dr. Angel Yanagihara, research professor at the University of Hawaii, whose own encounter with these venomous creatures left her bedridden and in agony for days, has devoted the past 16 years to unraveling the secrets of these box jellies. With her impressive background of multiple scientific degrees, awards, and accolades, Dr. Yanagihara has literally spellbound our Team with her knowledge of these unique animals. After sponges, box jellies, which date back 600 million years, are the oldest body-structured animals on Earth. 600 million years old. 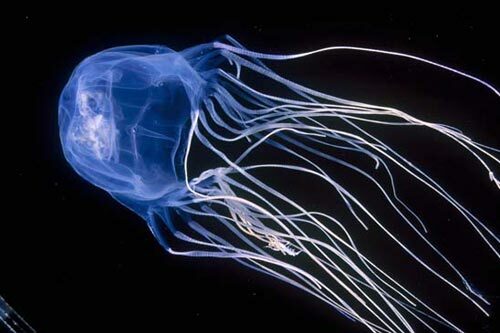 They are the only jellyfish that propel themselves, as fast as 4 mph. They have four sets of six eyes and thus can see their prey. Their heart-stopping venom is considered the deadliest in all the oceans, acting instantly to paralyze the heart and nervous system. The Box have caused more loss of human life in the past 50 years than shark bites, many of their victims dying before making it to shore. My first experience is a nightmare I honestly wouldn't wish on my worst enemy. It was the stuff of science fiction. Once out of the water, 36 hours after the initial stings, we could see the deep red tentacle lash marks, exposing thousands of tiny venom-injecting harpoon tipped tubules deep in the skin. But at the moment of the sting, I couldn't discern just where on the body the tentacles were attacking (unlike the Portuguese Man of War, for instance, which is highly painful and one can experience respiratory distress... but I'll take literally a thousand Men of War stings over ONE BOX). The immediate sensation was my entire body submerged in hot, burning oil. I was yelling "FIRE, FIRE, FIRE!!!!!" Then some five or six minutes later, the grip of paralysis seized my thorax area. Both my spine and my heart were under attack. Our EMT shark diver, who came in to help me and was stung also, climbed onto the boat and was startled when his breaths per minute plummeted to three. Jon and I both survived, but we were evidently lucky. The next time out, I wore some protective covering (literally only the lips exposed) but learned, the hard way, that these animals are genius, so to speak, at finding any millimeter of exposed skin. The next time, Dr. Yanagihara was on our Team. Over the course of 16 years of studying these intriguing jellies, she has developed a complex sting inhibitor referred to as a "Sting Stopper," which presents a chemistry that successfully inhibits the Box Jelly tentacles from releasing their harpoons and injecting their venom. 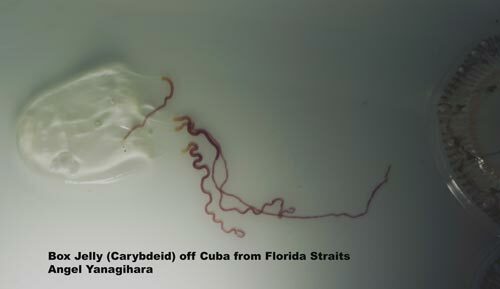 My Cuba attempt of last summer, August 2012, was thwarted by a myriad of forces, along with jellyfish. It was Mother Nature on Steroids out there. Whereas it's true that my lips, which we couldn't coat with the gel and get to stick, were stung and I once again suffered the anguish that the Box so perfectly inflict, we used the gel around the neck and across the shoulders and all those stings were both avoided and greatly mitigated. Angel has also developed an After Sting substance. 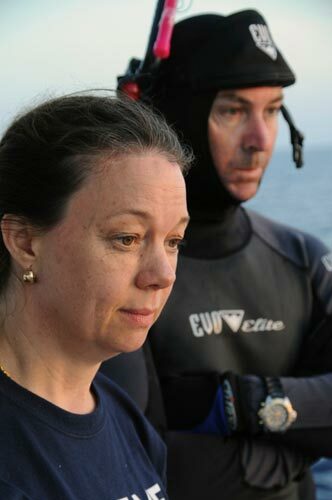 When I would scream out with the pain of a sting, I'd try to get to the side of the boat in a hurry where Angel and my Head Handler Bonnie Stoll would deftly wipe tentacles from the affected area and apply the After Sting substance. I had half a fighting chance. I'm one lone swimmer, trying to achieve a lifelong dream of the imagination in this Cuba crossing. But I'm somewhat of an accidental pioneer explorer when it comes to the Box Jelly. We have learned from Dr. Yanagihara that the worldwide explosion of jellyfish populations may be due to global climate change and our egregious human mismanagement of the oceans and our cruel slaughter of some 70 million sharks yearly. Once relegated to Southern Oceans, off Australia, the Box Jelly now populate Thailand and Japan and Israel... and the Florida Straits, with recent alarming swarms up and down the Atlantic Coast of Florida. If you are a fan of National Geographic and Discovery and those wonderful Nature publications and programs, you may have noticed that the focus last couple of years has turned to jellyfish. They are now dominating our oceans. 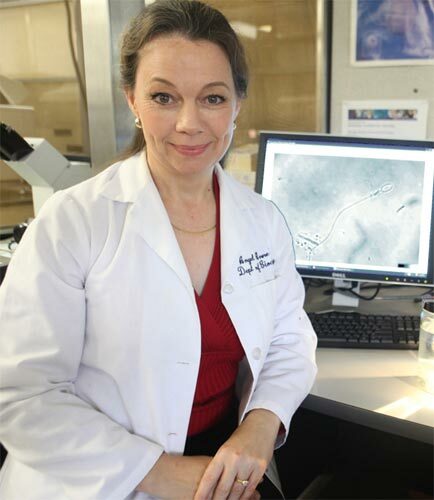 And you will see Dr. Yanagihara spotlighted on these programs, explaining how the radical Box Jellyfish escalation is glaring evidence of the declining state of the "world's great last wilderness". I am going to try Cuba ONE MORE TIME. I have spent this last year dedicated to some new protocols to safely swim through these highly dangerous animals. But Angel will be on the deck, just a couple of meters away, should a tentacle find its way through my gear. I could say "Not Fair." This isn't the swimming I knew when I was in my 20's, having to resort to cumbersome "armor" to avoid potentially fatal stings. The gear (silicone mask, surgeon's gloves, body skin suit) are cumbersome. They slow me down, take much more effort per hour, and interrupt the normal breathing process. But our Team, at least, could not come up with another viable solution. Desperate measures for desperate times. And these indeed are different times, different oceans. 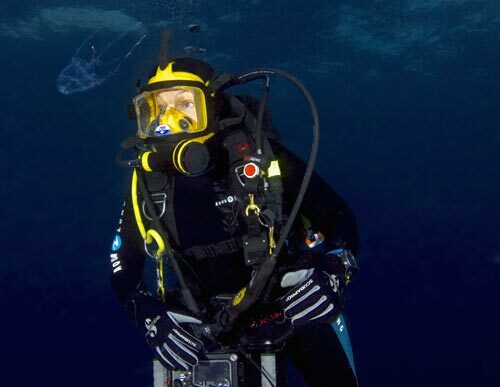 As Angel Yanagihara puts it so poignantly, in terms of taking our cue from the new, huge, swarming populations of the Box Jellyfish: "We are used to considering jellyfish a sinister nuisance but rising numbers of these animals are a genuine global wake-up call. We need to take real steps to protect and restore natural biodiversity in our oceans before it is too late. Humankind, take note."